Unconnected to the current systemic financial malaise in Europe, a recent visit to Oslo by British Prime Minister David Cameron for a meeting with his Norwegian counterpart Jens Stoltenberg went largely unnoticed. However, its ‘crude’ significance cannot be understated and Cameron’s visit was the first by a British Prime Minister since Margaret Thatcher’s in 1986. Beaming before the cameras, Stoltenberg and Cameron announced an "energy partnership" encompassing oil, gas and renewable energy production. As production from established wells has peaked in the Norwegian and British sectors of the North Sea, a lot has changed since 1986. The two principal proponents of exploration in the area are now prospecting in hostile climes of the hitherto unexplored far North – beyond Shetland Islands and in the Barents Sea. Reading between PR lines, the crux of what emerged from Oslo last week is that both governments want to make it easier for firms to raise money for projects and to develop new technologies bearing potential benefits in terms of energy security. That Cameron is the first British PM to visit Norway in decades also comes as no surprise in wake of media reports that the Norwegian sector of the North Sea is witnessing a second renaissance. So of the growing amount of oil the UK imports since its own production peaked in 1999 – Norway accounts for over 60% of it. The percentage for British gas imports from Norway is nearly the same. "I hope that my visit to Oslo will help secure affordable energy supplies for decades to come and enhance investment between our two countries. This will mean more collaboration on affordable long-term gas supply, more reciprocal investment in oil, gas and renewable energies and more commercial deals creating thousands of new jobs and adding billions to our economies," Cameron said. For their part the Norwegians, who export over five times as much energy as they use domestically, told their guest that they see the UK as a reliable energy partner. We hear you sir(s)! Meanwhile, UK Office for National Statistics’ (ONS) latest production data released this morning shows that extractive industries output fell by 15% on an annualised basis in April with oil & gas production accounting for a sizeable chunk of the decline. A further break-up of data suggests oil & gas production came in 18.2% lower in April 2012 when compared with the recorded data for April 2011. Statisticians say production would have been higher in April had it not been for the shutdown of Total’s Elgin platform in the North Sea because of a gas leak. Elsewhere, farcical scenes ensued at the country’s Manchester airport where the airport authority ran out of aviation fuel causing delays and flight cancellations for hours before supplies were restored. Everyone in the UK is asking the same question – how on earth could this happen? Here’s the BBC’s attempt to answer it. Finally the Oilholic has found time and information to be in a position to re-examine the feisty tussle for Cove Energy. After Shell’s rather mundane attempt to match Thai company PTTEP’s offer for Cove, the Thais upped the stakes late last month with a £1.22 billion takeover offer for the Mozambique-focused oil & gas offshore company. PTTEP’s 240 pence/share offer improves upon its last offer of 220 pence or £1.12 billion in valuation which Shell had matched to nods of approval from Cove’s board and the Government of Mozambique. The tussle has been going on since February when Shell first came up with a 195 pence/share offer which PTTEP then bettered. Yours truly believes Cove’s recommendation to shareholders in favour of PTTEP’s latest offer does not guarantee that the tussle is over. After all, Cove recommended Shell’s last offer too which even had a break clause attached. Chris Searle, corporate finance partner at accountants BDO, feels the tussle for control may end up with someone overpaying. “I’m not surprised that PTTEP have come back in for Cove since the latter’s gas assets are so attractive. Of course the danger is that we now get into a really competitive auction that in the end will lead to one of the bidders overpaying. It will be interesting to see how far this goes and who blinks first,” he concludes. Cove’s main asset is an 8.5% stake in the Rovuma Offshore Area 1 off the coast of Mozambique where Anadarko projects recoverable reserves of 30 tcf of natural gas. Someone just might end-up overpaying. On the pricing front, instead of the Spanish rescue calming the markets, a fresh round of volatility has taken hold. One colleague in the City wonders whether it had actually ever left as confusion prevails over what messages to take from the new development. Instead of the positivity lasting, Spain's benchmark 10-year bond yields rose to 6.65% and Italy's 10-year bond yield rose to 6.19%, not seen since May and January respectively. Last time yours truly checked, Brent forward month futures contract was resisting US$97 while WTI was resisting US$82. That’s all for the moment folks! The Oilholic is off to Vienna for the 161st OPEC meeting of ministers. More from Austria soon; keep reading, keep it ‘crude’! © Gaurav Sharma 2012. 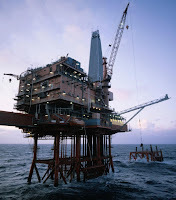 Photo: Oil Rig in the North Sea © Royal Dutch Shell.